Here it is! The first issue of a long-held dream! 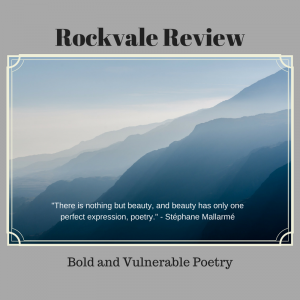 Welcome to the world, Rockvale Review! I started thinking about creating an online poetry journal 5 years ago. Frankly, it seemed overwhelming in more ways than one. Anytime you attempt something you’ve never done before, you run into a bit of a learning curve. In this case, there were many things to figure out—some techy, like building our website, and some organizational, like deciding how to handle the submission load. Starting a journal meant I would have to redistribute my time and share space with other things that are very dear to me: family, art, triathlon, mentoring, travel, retreats, and my own poetry writing. It meant jumping into a world of online publishing I knew little about. Have you ever done something simply because it felt right, because you knew deep inside that the various experiences of your life were leading you to create something, to explore, to dare? I love writing poetry. I love reading it, listening to it, sharing it, studying it. I also love poets. I’ve found in my poet friends people that deeply care about our world and the people in it, but also in the nuances of expressing emotion within image, music with the sound quality of words, meaning within the shape of a poem on a page, little things that might be missed unless you pay close attention. And maybe that’s what it all boils down to—attention and a sort of deep down knowing. Knowing there are voices that have yet to be heard. Knowing there are poets that have something vital to say. I wanted to be a vehicle to carry those voices and those words into the world. Rockvale Review may be a new endeavor, but it’s certainly not a solo act. My fellow editors have been amazing blessings as we discussed, questioned, and worried our way through the development of this first issue. Reading 300 submissions and nearly 900 poems is a big job, even with 5 of us. I can’t say enough about my respect for these women and how impressed I am with their thoughtful responses, careful consideration of the poems we received, and their patience and understanding as I stumbled my way through the process. To Nancy, Roseann, Christine, and Laurie: my utmost gratitude and appreciation. To our poet submitters: you made me laugh and sigh and smile and feel in a hundred different ways. 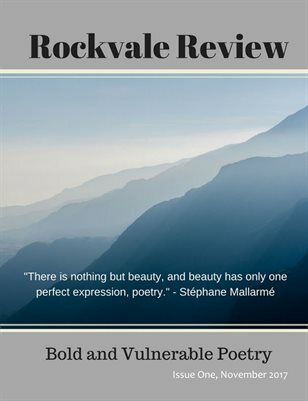 You are why Rockvale Review exists. Thank you for sharing your words with us. Thank you for being brave enough to take the risk of letting your hearts be seen. To our readers: I hope you find something in this issue that touches your heart, your mind, and your imagination. This is to you from all of us. If you wish to order a print copy of Issue One, you can do so by clicking the red MagCloud link below. Print copies are $12 plus shipping. Digital issues for all your devices are free with the purchase of a print issue. For links to individual poems, just click on the poem titles below. Enjoy!